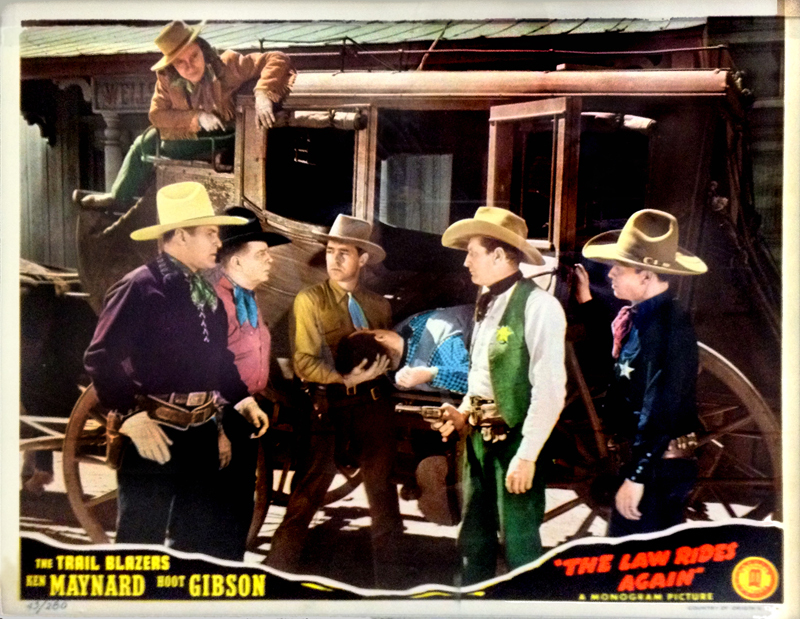 SCVHistory.com LW2328 | Melody Ranch | Lobby Card: Ken Maynard, Hoot Gibson in 'The Law Rides Again' (1943). Lobby Card for "The Law Rides Again"
Lobby card for "The Law Rides Again" (Monogram Pictures, 1943), starring Ken Maynard (left) and Hoot Gibson (second from left). Filmed at the Monogram Ranch (later called Melody Ranch) in Placerita Canyon, and at Corriganville in Simi Valley. Maynard, Gibson and other major Western stars of the 1920s were still big enough box-office draws in the 1940s to pull a Saturday matinee crowd. They teamed up for "trio pictures" — in the instance of Maynard and Gibson, they were the Monogram's Trail Blazers, with Bob Steele or Chief Thundercloud (here) rounding out the trio. "The Law Rides Again" is produced by Robert Emmett Tansey, directed by Alan James; players include Jack La Rue, Betty Miles, Emmett Lynn, Kenneth Harlan, Chief Thundercloud, Chief Many Treaties, Bryant Washburn, Fred Hoose, Kenne Duncan, Roy Brent, John Bridges, John Merton, Hank Bell, Charles Murray Jr., Steve Clark, Budd Buster, Foxy Callahan, Chick Hannan and Wally West. Edmund Richard Gibson earned the nickname "Hoot" when he worked as a messenger for the Owl Drug Co. He was born August 6, 1892, in Tekamah, Nebraska and appeared in more than 200 films (including short features) between 1910, when he earned $50 for his role in "The Two Brothers," and 1960, when he made an uncredited appearance in "Ocean's Eleven." Gibson did most of his work as a silent cowboy actor between World War I and the early 1930s. He directed a bit in 1920-21 and produced some of his own films from 1923-30. The 5'9" Hollywood giant died of cancer on August 23, 1962, in Woodland Hills  five days before a wildfire burned down Gene Autry's Melody Ranch in Placerita Canyon, where Gibson made some of his movies.